Proper management of patients with temporomandibular pain disorders (TMD) needs a multidisciplinary approach including several professionals such as medical doctors, dentists, physical therapists, osteopaths, chiropractors, acupuncturists, orthodontists, surgeons, and psychologists . Each professional will conduct an exhaustive clinical examination and will plan a multimodal program for these patients. In fact, treatment should be personalized based on the patient’s experience and including different therapeutic strategies such as passive and active techniques, active listening, empathy, and management of psychosocial issues, i.e., depression, anxiety, and catastrophizing, always based on clinical findings during the history and examination. For instance, dentists could recommend hard stabilization appliances  or splint therapy  for reducing pain in patients with TMD, whereas physical therapists can apply manual therapies or exercises for the same objective. Clinical and scientific evidence suggest that an interdisciplinary work between dentistry and physical therapy increases the effects of each isolated intervention for patients with TMD . 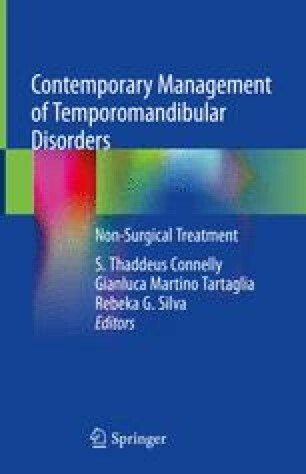 The current chapter summarizes different adjunctive therapies including physical therapy and chiropractic therapy for TMD. American Physical Therapy Association (APTA). Manipulation education manual for physical therapist professional degree programs manipulation. http://www.apta.org/uploadedFiles/APTAorg/Educators/Curriculum_Resources/APTA/Manipulation/ManipulationEducationManual.pdf. Accessed 1 April 2017. Weeks J, Goldstein M. Meeting the nation’s primary care needs: current and prospective roles of doctors of chiropractic and naturopathic medicine, practitioners of acupuncture and oriental medicine, and direct-entry midwives. 2013. https://doi.org/10.13140/RG.2.1.2253.9123. American Chiropractic Association website. What is chiropractic. 2017. https://www.acatoday.org/Patients/Why-Choose-Chiropractic/What-is-Chiropractic. Palmer College of Chiropractic website. Benefits of chiropractic. 2018. http://www.palmer.edu/about-us/what-is-chiropractic. State of California Board of Chiropractic Examiners. https://www.chiro.ca.gov. Ballenberger N, von Piekartz H, Danzeisen M, Hall T. Patterns of cervical and masticatory impairment in subgroups of people with temporomandibular disorders-an explorative approach based on factor analysis. Cranio. 2017:1–11. https://doi.org/10.1080/08869634.2017.1297904. Cervical spine, TMJ, occlusion and whole body. BioMed Res Int. 2014;2014:582414. https://doi.org/10.1155/2014/582414.